This Feeler Gauge Assortment set has what you need to dial in your padding work. Included are 2 delrin handles with O-rings for holding the feeler gauge material, and 4 different thickness of material in 1”x 5” strips. Thicknesses are silver: 0.0005”, amber 0.001”, red 0.002”, and green 0.003”. Use silver or amber for greater sensitivity on professional level instruments, and red or green for more relaxed tolerances on student instruments. 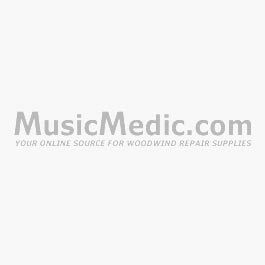 Ideal for flute and clarinet padding, as well as aiding in saxophone padding in places that are difficult for a leak light to be, such as baritone sax palm keys, the backside of the low C#, etc. Simply select your material, use a razor blade or knife to cut a small strip in the desired shape and length, and secure it to the delrin handle via the O-ring.